It’s been a long time since we’ve had a blog post on family travel on this website so today, I’m excited to introduce to you Cliff from Live Family Travel. His San Francisco based family spent ten months traveling the world on a career break. They homeschooled and enrolled their kids in schools overseas, spent time with family, saw the world, and bonded as a family. And, they did so, on a budget this nomad is impressed with. Today, Cliff is going to share how his family did it – and advice for other families looking to do a big round the world adventure. My dream of taking my family on a world tour began in Nicaragua in the summer of 2012 with my two daughters, who were three years old and six months old at the time. Most people thought my wife and I were crazy to go to Central America with two little girls. But, for three weeks, we relaxed at the beach in San Juan del Sur, rode horses through the countryside, and hung out in the bustling town of Granada. It was an experience we vowed to repeat. Over the next couple of years, we traveled together to various destinations, including Puerto Rico, Peru, Argentina, and Guatemala. We enjoyed these short trips but, the more we traveled, the more I wanted to go longer – I wanted a year-long trip around the world. In 2015, that dream became a reality as we spent 10 months traveling in 10 countries. But to make that happen we needed to be creative with how we saved and spent our money. My family lives in one of the most expensive areas in the world: Silicon Valley outside San Francisco, California. Housing prices are extremely high and the overall cost of living is higher than most cities in the United States. I worked as a marketing manager in technology companies while my wife took care our two daughters. I worked freelance jobs. I earned extra money for work on short-term marketing projects, in addition to my full-time job. Now with the on-demand gig economy, there are many great options to earn extra money, including Uber, Lyft, and Wonolo. We refinanced our mortgage. With a lower interest rate for our home mortgage, we saved over $500 USD per month. I reduced my 401(k) and 529 contributions. Instead of putting all of my savings into my retirement account and my daughters’ education accounts, I decided to reallocate about $500 USD per month to our travel funds. We reduced our spending. We cooked most meals, capping our food budget at $1,000 USD per month. We also stopped buying unnecessary electronics, clothing, and toys, limiting our discretionary spending to $500 USD per month. By earning more, spending less, and reallocating a portion of my savings to travel, our travel budget gradually increased to a point where we felt comfortable enough to take time off to travel the world. But in order for this trip to really make financial sense, we needed to do something about our house while we were away. We did this by renting our house with a family found through Craigslist. Thankfully, this area is in demand and after accounting for our mortgage, insurance, and taxes, we were making $500 USD per month profit from the renters, which helped pad our travel fund. Additionally, we sold our SUV, which ended our $700 USD per month loan payment. We also sold all our furniture and about 80% of our electronics, clothes, shoes, and toys through Craigslist and some local Facebook groups. In total, we made about $5,000 USD from these sales. With about $10,000 USD of extra money from rent payments and selling our stuff and the $40,000 USD in savings, we created a budget of $50,000 USD for our trip. We knew we had to make our money stretch as far as possible by being savvy with how we saved and spent on the trip. For more information on how you can save money for your own trip, click here. Below is a list of some of the expenses of our trip per country visited. (Later I’ll go into more detail about how we accomplished this.) With this information, I hope you realize that extended family travel around the world can be affordable and realistic. All you need is a curiosity to explore the world, flexibility, and a bit of budgeting skills. Further Reading: Check out a breakdown how we spent our money in Europe. 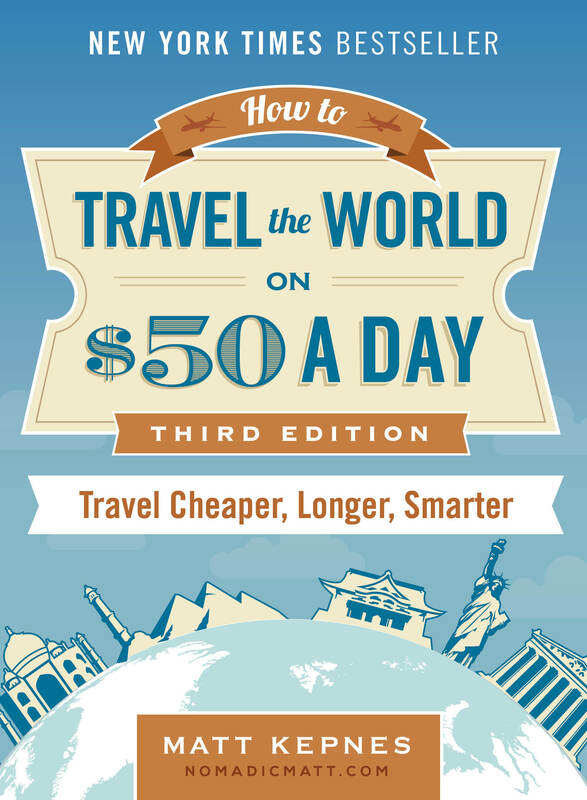 To get an idea of how much your dream destination costs, check out these free travel guides. We used our frequent flyer miles. In total, I used 250,000 miles for free airplane tickets on Star Alliance airlines on this trip: 100,000 of those miles came from signup bonuses for Chase Sapphire Preferred credit cards for both my wife and myself. After $4,000 USD spent on each card, we were awarded the signup bonus of 50,000 points, which were converted 1:1 for Star Alliance miles. It’s our travel credit card of choice because there are no foreign transaction fees. Another 100,000 of those miles came from the accumulation of miles through flights flown by all four of us in the previous years. The remaining 50,000 miles came through spending on the cards over two years. A great site I use is The Points Guy and Matt has a great book on the subject too. We purchased cheap flights. For flights that were paid in full, I used travel comparison sites like Google Flights and Kayak to find the best prices. In Asia and Europe, there were many budget airlines that made flying economical, so those flights didn’t take a huge chunk of our travel budget. For example, for all four of us, one-way flights from Venice to Barcelona were $420 USD on Vueling Airlines and round-trip flights from Phuket to Kuala Lumpur were $435 USD. We stayed at our parents’ places. For about 45% of our time away from home, we stayed with my mother in Honolulu, Hawaii, and my wife’s folks in Hangzhou, China. Not only did we spend quality time with our extended families, but we also saved a ton of money on accommodations. While our situation is unique in that we have parents in different parts of the world, there are great options for free housing, including sites like Couchsurfing, Servas, Hospitality Club, and housesitting opportunities. It’s not as easy as what we had but it still works and is an option families can use! We did free activities. 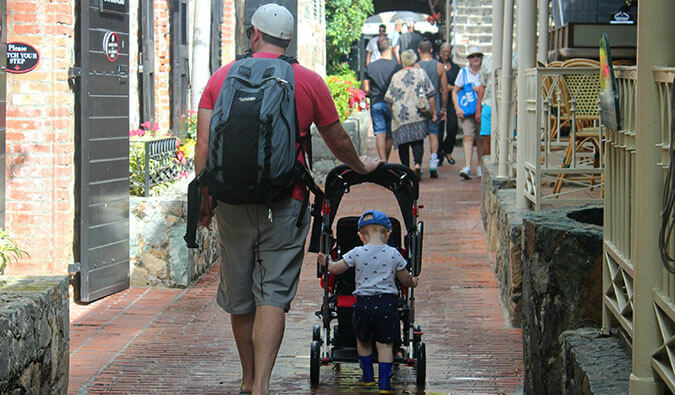 There are lots of free activities to do with kids while abroad, including going to beaches, parks, markets, shopping malls, churches, and outdoor festivals. Even for expensive cities like Rome and Barcelona, there were always free things to do. For example, from having read an article in National Geographic, we went to the Picasso Museum in Barcelona on one of its free Sundays, and we walked around the Gothic Quarter of Barcelona to watch the various street performers. We cut our transportation costs. In Phuket, we rented a moped (for all four of us!) for $133 USD per month. In China, we took cheap taxis or rode the bus. In Europe, we rode the subways or the buses, which were not expensive (e.g., $1 USD per bus ride in Florence and Barcelona). By taking public transportation or walking whenever possible, we kept our daily transportation costs low. We cooked most meals. With a kitchen at our parents’ places or our Airbnb apartments, we ate a majority of our meals at home, especially in Europe. When we ate at restaurants, we ate simply or at inexpensive lunch buffets (e.g., $10 USD for a Japanese lunch buffet in Florence). In Asia, eating at restaurants was fairly cheap, so we didn’t need to cook at home as much. For more information on how to save money while you’re on the road, click here. ****Family travel can be stressful, with all the planning, movement, logistics, new time zones, new languages, different foods, and taking care of the kids. It’s never really a vacation with children, because the majority of your time and energy will be used to take care of them. But family travel is also very rewarding. When you travel together, you collect memories and build the bonds of your family through the shared experiences of being in different countries, interacting with different people, speaking different languages, and eating different foods. By getting out of your comfort zones and traveling the world, you allow your family to learn and grow in ways that could never happen at home. One of my warmest memories (and there are many) comes when we were living in Barcelona, Spain. We found a trilingual preschool (English, Spanish, and German) that allowed our daughters to enroll for the entire duration of our stay in Barcelona. They became immersed in the Spanish culture and language, made local friends, and went on many field trips. It was amazing watching them learn to interact with the locals, learn a culture, and grow as people. They developed a cultural understanding that just wouldn’t have been possible if we had stayed home. I know this is a positive experience that will live with them forever. Whether for three weeks during a winter break, three months in the summer, or a full year, budget family travel is possible. Traveling through 10 countries in 10 months with my family was a great learning experience and a dream come true. Despite all the headaches, fevers, upset stomachs, hot days, lost items, frustrating situations, and everything else that we went through during our trip, it was all worth it and we grew closer together as a family. And there’s no better feeling than that as a parent. Cliff Hsia is a writer, husband, and father who is determined to live a better-than-normal life by traveling the world, slowly and purposefully, with his wife and two young daughters. 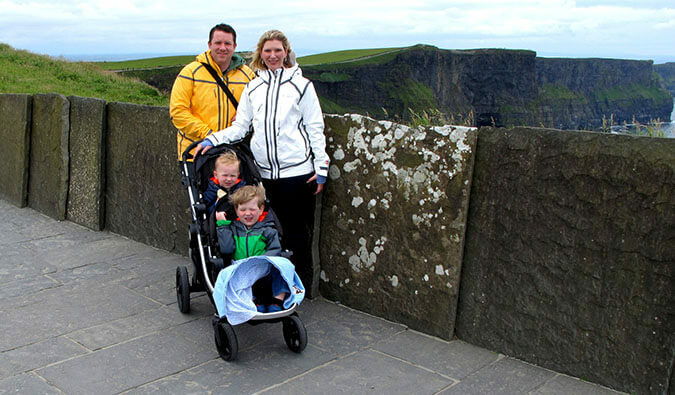 He writes about travel, parenting, and lifestyle design on his blog at Live Family Travel. Connect with him on Facebook and Twitter. This is so class, I love the renting a moped ‘for all four of us!’. I always marvel at the teetering families on their Honda 90’s around Asia, and you totally did it… awesome. I love the fact that you spent extended time in most of the destinations too, that always pleases me. Hope you continue to love your family travel, my sister has 3 kids and I’m definitely showing her this! Thanks, Sarah. The moped riding was fun, and I’m glad we didn’t have any accidents. Slow travel is definitely more rewarding and easier. You may be the first family that I’ve read about who traveled around and enrolled their kids in school in different places rather than just homeschooling the whole time. It never occurred to me that you could do that for just a month, but I’m sure it was a great experience for your kids. What a good way to immerse them in the culture. Thanks, Jen. Enrolling our kids in local schools was the best way for our family to create balance on our trips. The kids were engaged and having fun, and my wife and I would have our own time to do some activities without the kids. We are leaving next August for our year. Kids will be 6 and 9. Wondering how you went about enrolling kids in school. Traveling with small children seems like a nightmare to me…not very relaxing at all. But, it is good that they pulled it off on the cheap. Hi Krystal, Traveling with kids is definitely not relaxing, but it is rewarding. Krystal, I definitely agree with you! Traveling with kids sounds like a nightmare but maybe cause I have none. hahahaha. Cliff, you made it sound so easy. I\’m sure there were ups and downs. What\’s your greatest advice for family travel? Awesome! I’m always excited to see and read about families traveling. Also with this budget breakdown, I can present it to my husband – maybe we can do more traveling than I’d hoped! Thanks, Natalie. Yes, I hope the specific numbers help you discover that family travel doesn’t need to be expensive, especially in Europe. I so agree. We traveled with our two boys for almost a year. Mostly in the US (we\’re from Israel) and also Canada and the UK. Nothing brings a family together like taking a long slow-paced trip together. And it doesn’t have to be expensive. People sometimes wonder how we did it, but just like described here when you travel at a slower pace, take time to enjoy all the wonderful free places around you, stay with people (we couch surfed some of the time), or rent apartments, it’s not that much more expensive than your life back home. Thanks, Anne. Yup, we spent less traveling for 10 months than we would have spent for the same amount of time at home. It can be done. This is awesome. I wish more people realized that you can travel with a family and make it work. So many people say “I want to travel before I get settled down” well, who says you need to settle down? Thanks, Katarina! Yes, you definitely cannot defer your travel dreams, even if you have kids. Kids should be the reason you travel, and travel often. I absolutely love this! We travel full-time now (sold our house last year), and plan on traveling full-time when we have children as well, at least for the beginning years. And best wishes on your travels! What an incredible experience for your family! I think it is great you spent some serious time in each place too, and even got to work in extended time visiting family. How did your kids handle the long term travel? Was it hard on them or did they adapt quickly? Hi Sonja, Our kids were really adaptable and flexible when traveling and embraced the adventure of the trip. Having them enroll in local schools for our extended stays helped give them the familiarity and structure they needed. Happy that you had a great time while you were in Barcelona. Did the kids maintain their knowledge of the Catalan language? At any rate, kudos for affording the best travel experience to your children. I’m sure such an experience is invaluable and they will treasure it for the rest of their lives. Great tips, Cliff! Thanks for sharing. True, sometimes we need to cut some unnecessary expenses when saving for our goals! When I had a plan to travel abroad, I bought the local currency monthly, just in case that there’s an increase on the exchange rates haha! Hats off to this family. The way they have planned their travel is amazing. This is such an inspiring story, showing us that we can travel the world without spending a fortune. I love how their children will have experienced so many different cultures and been able to go to school in all those amazing countries! Just Wow! Such an inspiring post. If we decide our priorities and manage our budgets smartly, anything is possible. Hats off to the family. Wow! Hats off to you and your family for doing this! My wife and I have already experienced traveling long-term, but should our small family of two get bigger, it’s nice to get ideas of how we can do it too. Stories like yours help us see the possibilities. Will certainly take note of this for future reference. Thanks for sharing your experience! I love this. This is what we are working towards. It is so true that traveling “allows your family to learn and grow in ways that could never happen at home.” We love the amazing changes and growth we see in ourselves and our girls. It is amazing! What a wonderful family! I was in awe throughout while reading the post. You guys make one heck of a family, Cliff. Your children will be so thankful for the memories when they grow up 🙂 A very well written post with simple and detailed tips. Thanks! Great, inspirational idea for comfortable and educational family journey. Thanks for your tips. In which school did you put your children in Phuket? Cliff – I went to Nicaragua a little after you in 2013. The perceptions about it not being safe for a family are definitely inaccurate. I am glad to hear that trip launched your family’s global aspirations! What a wonderful trip for you and your family. We are doing much the same as you and followed most of your steps but a few years ahead of you. We are a couple well into our upper mid-60s now. 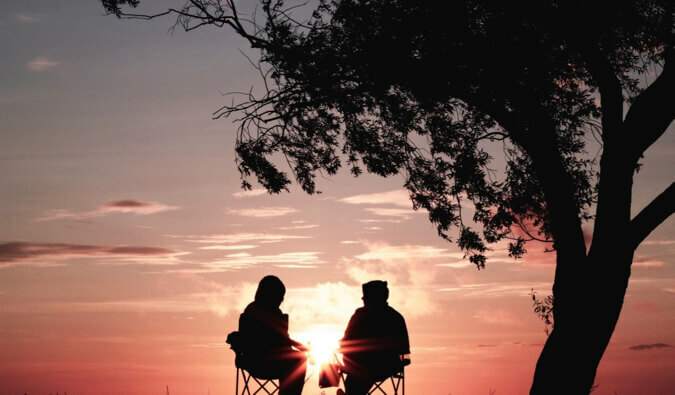 We have been on the road for more than two years and do it all on $1825 a month from our retirement account. We are able to live on less than $61 a day including all travel expenses. When we see a little money dwindle we go to Chiang Mai and are able to save $1000 a month while living there to replenish any money used. We have been to over 40 countries now and just finished a summer that included Mongolia, China, Nepal, Myanmar, Thailand and the Philippines and are now in the south of France for the winter. Don’t make this a one-time occurrence if at all possible, the time with your children is worth every cent you spend. That time can never be regained once it is lost, money can be replaced. Sounds fabulous and you’re very lucky to have parents living in such amazing places. Our family of four is taking a similiar gap-year in 2017. Airbnb looks like it will be our primary residence. Glad your kids enjoyed the trip – hoping we get into the groove once on our way. Inspiring story Cliff! I want my future children to travel, be diversified, and culturally educated. How did you manage your expenses during high travel seasons? Thanks for sharing your story. And thanks for reminding us why its important to travel while our children are still young. I’m surrounded by family and friends who tell us to wait until they’re older, when they’ll be able to remember and I start to believe them. I know that the trips we take now, even if they don’t remember them, will help form their characters and outlooks on life and on the world. Great post and very informative! How old were your girls on this trip? Travelling along with small kids is quite frustrating, but it is most precious moments you will be shared with them while they are still young. Indeed, it’s rewarding see them happy and having fun. Hello, Can you please tell me how and where you enrolled your kids in Barcelono. We are traveling with a teenager. Any other ideas of taking classes at different places? Hi Cliff, love your story!! We travel a lot with the kids, but travelling long term, like you guys do, is still one of my biggest wishes :). Somehow I keep on seeing problems, like schooling the kids, quitting our jobs etc. Your article helps me see things in perspective money wise. Thanks! Would love to read more of your adventures and tips. I loved reading this, and that’s an impressive (and realistic) budget!! I really like the idea of putting kids in short-term school. I think the next time we do some long-term travel we’ll do that as well. It balances the kid’s socialization and some adult time. Any plans for more long-term travel in the future?